D1105 1/2" deep upper door track for use with D1107. 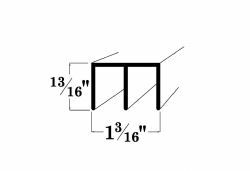 Sold in 12 ft. lengths, also sold as a door track kit. Available in satin anodized finish. See above Docs link for other 1/2" Material sections. Select a Length 12 ft. 6 ft.